Does your IT infrastructure efficiently combine compute, storage, and networking/fabric resources with intelligence and security to meet your needs of today and tomorrow? 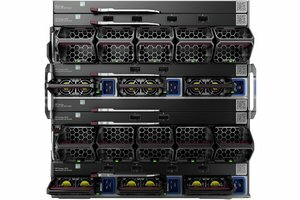 HPE Synergy 12000 Frames are uniquely architected as Composable Infrastructure (CI) to match the powerful 'infrastructure-as-code' capabilities of the HPE intelligent software architecture. Flexible access to compute, storage, and fabric resources allows for use and re-purposing. Linking multiple HPE Synergy Frames efficiently scales the infrastructure with a dedicated single view of the entire management network. Creating multiple composable domains in the infrastructure can efficiently deliver available resources to the business. HPE Synergy Frames reduce complexity by using intelligent auto-discovery to find all available resources to accelerate workload deployments. This drives IT efficiency as the business grows and delivers balanced performance across resources to increase solution effectiveness. High infrastructure bandwidth (over 16 Tb/s) helps you to perform well on today’s data-intensive applications and on next-generation, mobile-first, cloud-native applications. The design also utilizes a true passive mid-plane to assure highly-reliable operation. And it's photonics ready!